Starlings had once made a nest in the place I chose for shooting theParade: the fire escape on the fifth floor of the Phoenix Building, locatedat the intersection of Center & Washington Avenues. It's a place wherepigeons still come to drop a message to the unsuspecting pedestrians below.Sunday, there were no pigeons, but there was a lively crowd on both sides ofCenter as the first police cars crossed Madison with their sirens blaring,around 3 PM. 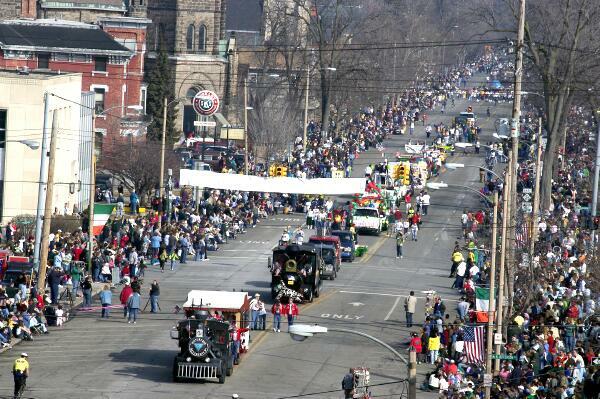 It was a near-perfect day for the parade, with a clear sky, bright sun, andthe thermometer chasing 60+ degrees. I made my way to the fifth floor (myoffice is on 3), and I unpacked the 70-200mm telephoto lens. More about thatfire escape; it looked to be as old as the building itself, so I spent mostof my time composing from the window, and only darted out to get the shots Iwanted before returning to the safety of the solid floor. I wanted more bands. Even though the pipers played "Scotland the Brave". Iloved the sound reverberating off Chemical Bank¹s white metal skin. 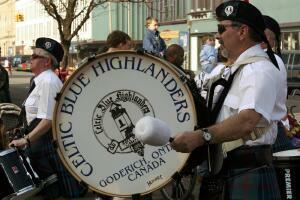 Thanksto Goderich and the other pipe bands for bringing the real Celtic sound tothe Parade. 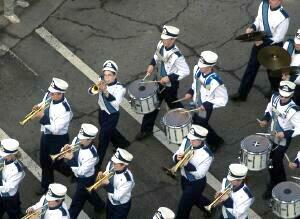 The high schools that volunteered their marching bands allsounded great, too. Sure, therewas the inevitable chain of convertibles with their rowdyoccupants riding on the trunks and waving to friends and relatives on thesidelines; the balloon-festooned pickup trucks pulling speedboats, airboats,flatbed trailers, candy wagons, and floats; the assemblage of numerouspolice cars from all over the County, ambulances, rescue vehicles, buses,limousines, and (of course) the big fire engines. The leader dogs knew theirway down Center, keeping their human handlers on a straight path. Did anyonesee horses? So what if this year¹s parade looked less and less like the publicmanifestation of Irish heritage as seen in years past. 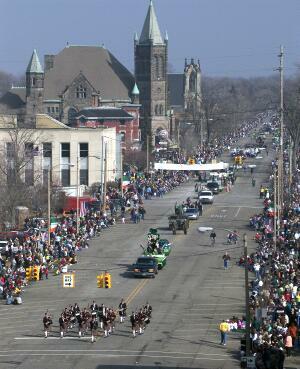 The St. Patrick¹s DayParade is Bay City¹s annual rite of spring. It was a great and glorious dayto be outside applauding and cheering, like nearly everyone did, for thesoldiers and sailors representing our Armed Forces, who might have beenpreparing for duty overseas. Hopefully they will all be here for next year'sspring march down Center Avenue, and that we'll be here to thank them fortheir service. Andy Rogers, owner of Rogers Projects, is a graphic artist, publication designer, photographer, and musician. A life-long resident of Bay County, he and his wife, Sandy, currently live in Essexville.